The word "bulb" is often used for any plant that can store food underground. This includes true bulbs (tulips and daffodils), corms (crocus), tubers (anemone), rhizomes (lily-of-the-valley) and tuberous roots (ranunculus). This ability to store food is what makes gardening with bulbs relatively easy. With a little planning, proper planting and water, the bulb will take care of the rest! The optimum pH range for spring flowering bulbs is 6 to 7. If needed, limestone should be worked into the soil to raise the pH, while sulfur or aluminum sulphate will help in lowering a high pH. A soil test will provide information on the recommended amounts. Spring bulbs need ample amounts of phosphorous in the soil to encourage root and bud development. If your soil requires additional amounts, phosphorous should be mixed in the soil below where the bulbs will be located so it can be utilized by the bulb's roots. Sources such as bonemeal or superphosphate can be added in the lower part of the planting bed as it is being prepared. Do not fertilize spring flowering bulbs after they have started flowering, this tends to encourage the development of bulb rot and may shorten the life of the flowers. For bulb health and longevity, the soil must be welldrained but moisture retentive. In general, adding peat moss or compost will quicken drainage in heavy clay soils while slowing drainage to hold moisture in very sandy soils. Select a site that will provide at least five to six hours of direct sunlight a day. Decide on a design. Bulbs are much more attractive if planted in mass plantings or drifts and if the planting can be seen from a favorite window in the house. Then select quality bulbs—those that are plump and firm, not soft, rotted, moldy, dented or nicked. Spring flowering bulbs should be planted in mid-September through October when the soil temperature falls below 60°F. This will allow a root system adequate time to develop before the ground freezes. The general rule of thumb for successfully planting spring bulbs is to plant them at a depth two to three times the height of the bulb. This means that most large bulbs like tulips or daffodils should be planted about eight inches deep and eight inches apart. Smaller bulbs like crocus and anemones should be planted three to four inches deep and three to four inches apart. Planting depth is always measured from the bottom of the bulb. Tulips, daffodils, and hyacinths should be planted with the point of the bulb upward and the root plate downward. The best method of planting is to dig and loosen the entire bed to the proper depth. Press the bulbs into the soil in the planting area and cover with soil. Because the soil in a fully excavated bed will generally drain better, the planting should last longer than individually planted bulbs. This method of planting is preferred over trying to plant bulbs one-by-one with a bulb planter. In many soils, bulb planters do not work well, especially in compacted or rocky soil. Watering the bulbs following planting will help to settle the soil in the planting bed plus provide needed moisture for the bulbs to start rooting. Fall planted bulbs must be well rooted before the ground freezes, so timing and preparation is key for a successful design. Avoid over-watering at planting time since this can result in bulb rot. The bulb bed should be covered with two to three inches of mulch which helps minimize temperature fluctuation and maintains an optimal moisture level in the planting bed. The small, early blooming bulbs should only be lightly mulched to avoid interfering with their emergence and bloom. When flowers fade, cut them off to prevent seed formation. Seeds take stored food away from the bulbs. Following the peak bloom of your bulbs, the remaining foliage should not be removed or mowed off until it turns yellow and dies back naturally. The foliage on smaller bulbs such as snowdrops and squill will die back quite rapidly and cause little aesthetic problems in your landscape. 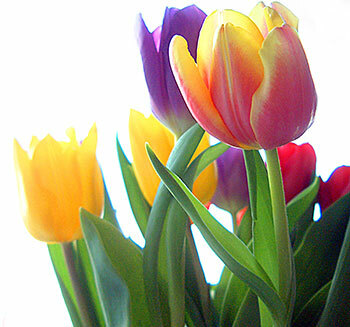 The foliage on larger bulbs such as tulips and daffodils can take several weeks to die back. The plant needs these green leaves to manufacture nutrients that are stored in the bulb for next year's growth and bloom. If the foliage is removed or mowed too early, the plant loses its ability to 'recharge' itself, resulting in a smaller, weaker bulb that will gradually decline and die out. Interplant spring-blooming bulbs with cold-tolerant annuals, such as pansies. Use groundcovers such as periwinkle or pachysandra. Interplant with herbaceous perennials such as hosta, daylilies, and ferns. Plant the bulbs behind taller growing herbaceous perennials or shrubs. Underplant with low-growing groundcover shrubs such as junipers, cotoneasters, and roses. Treat these winter hardy spring flowering bulbs as perennials that are left in the ground year after year. But when flowers eventually become smaller or fewer in numbers, it's time to dig up the bulbs and divide them before replanting. After several years in one location, clumps of bulbs will form and both stem and flower size will decline. Dig out and separate the bulbs around the middle of July, when the foliage has yellowed and withered naturally. Remove the foliage (tops), wipe the soil from the bulbs, and allow them to air dry. They can then be replanted in the fall, adding further life to your original investment and more color to your home landscape. Diseases – Most spring flowering bulbs have been selected for tolerance and/or resistance to most of the serious soil-borne diseases. Avoid planting diseased bulbs. The most prevalent foliar disease is Botrytis. Remove heavily infested bulbs. Insects – There are several insects that can attack spring flowering bulbs. Among them are aphids, thrips, and mites. Assistance for insect identification and the selection of the proper insecticide can be obtained from your local Cooperative Extension office. Weeds – Use a combination of cultural and mechanical techniques to control weeds. Hand pull or hoe emerged weeds. Two to three inches of organic mulch will also help to control weeds. Animals – Many spring flowering bulbs (such as tulips and crocuses) are edible to animals (voles, squirrels, rabbits and deer). Know the susceptibility for each bulb type. Refer to Rutgers Cooperative Extension publication E271, "Landscape Plants Rated by Deer Resistance". Cover the susceptible bulbs at planting time with wire mesh screening that allows the shoots to grow through. Repellants may be necessary. Spring flowering bulbs can be forced into bloom during the winter and early spring to bring color and fragrance indoors. The easiest to force are crocus, hyacinth, narcissus, scilla, muscari, iris and tulip. Starting in October through the end of November, bulbs can be planted in clean pots with adequate drainage holes. A good soil mixture contains one part loamy soil, one part organic matter such as peat and one part sand. Do not add fertilizer. Plant so that the tips are at the soil line. On average, 15 crocus, four to six daffodils, three hyacinths or six tulip bulbs will fit in a 6-inch pot. Pots should be held at 35°F to 48°F for a minimum of 12 to 13 weeks. Suitable locations would be an unheated basement, storage area, cellar or cold frame. After 12 to 15 weeks, the bulbs should be well-rooted and short shoots should be present. Bring the pots into a bright, cool room (55°F to 60°F). The bulbs will flower in three or four weeks. Discard the plant after flowering since forced bulbs will seldom rebloom when planted outdoors. Figure 2. 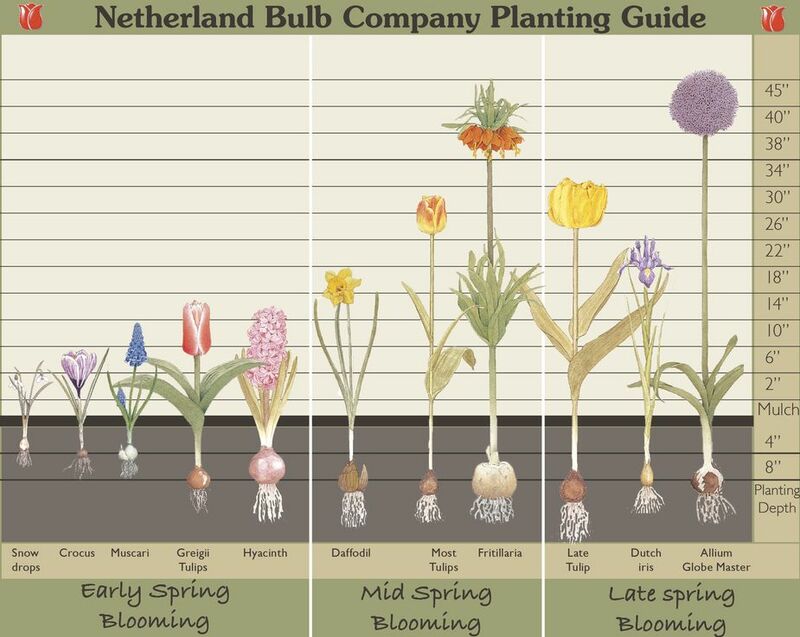 Chart courtesy of Netherland Bulb Company of Easton, Pa.